Niloofar Shahmohammadi, School of Medicine wellness coordinator, says a new Student WellConnect program offers students 24/7 access to professional help with life issues. Medical school can present unique personal challenges. A new student assistance program is available to all UMKC School of Medicine students to help work through such issues. Through a partnership between the School of Medicine and WellConnect by Student Resource Services, students now have 24-hour access to help with mental health, legal and financial issues. The WellConnect program links students with licensed counselors for up to six, confidential in-person or telephone counseling sessions, or three sessions with a financial consultant or attorney. The services are free for students enrolled in any School of Medicine program and their household families, said Niloofar Shahmohammadi, School of Medicine wellness coordinator. Students — Call 866-640-4777 or go to www.wellconnectbysrs.com. Faculty/Administrative Support Team (FAST) Line — Call 844-208-7070 or go to www.wellconnectbysrs.com. Access codes for students and faculty/staff can be found on posters and card in the School of Medicine Student Wellness Wing and throughout the building. Two years ago, Shahmohammadi began conducting brief, 10-minute wellness checkups with the school’s first- and second-year medical students. “Through those meetings, I was seeing a high number of students who needed more counseling,” she said. “Seeing that, we wanted to find something to meet those needs. The WellConnect program supplements the services provided by the UMKC Counseling Center by providing a one-stop shop for addressing student issues. Students can contact WellConnect by phone or online. They do not need a referral to use the service, Shahmohammadi said. Because WellConnect is a nation-wide network, it also benefits students in out-of-town rotations or research programs. Those students can contact the service and get needed assistance at any time while they’re away from the School of Medicine and Kansas City. 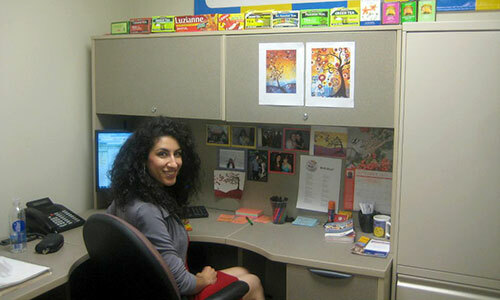 The service also offers an around-the-clock help line for faculty and support staff who have concerns about a student. The Faculty/Administrative Support Team (FAST) line provides high-level sessions with senior clinical consultants to discuss help for students struggling inside or outside the classroom. Access codes are required for students or faculty/staff to contact WellConnect. The codes can be found on posters and cards in the Student Wellness Wing and throughout the building. WellConnect was first launched at the School of Medicine in June and students are already utilizing the program. “I’ve already heard from students that are happy with the service,” she said.